N Street is a cohousing community that was started in 1986 when two tract homes built in the early 1950s took down their side fences. 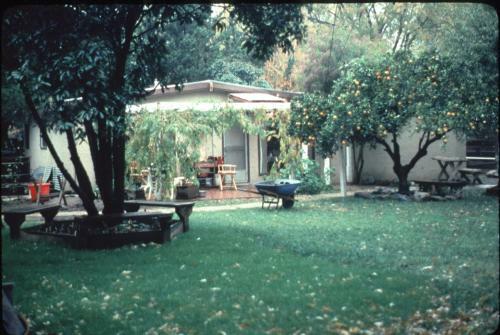 We started using a garage as a common house in 1988 after reading Cohousing: A Contemporary Approach to Housing Ourselves by Mccamant and Durrett. "N" Street continues to grow slowly, adding one house at a time. We currently have expanded to 20 houses, 13 homes on "N" Street that back up to 7 homes on the adjacent street. (Two of the homes on N Street are across the street from the community but are occupied by active members.) The removal of fences has created a beautiful open-space area that includes vegetable, flower gardens; a play structure; a hot tub; chicken coop, large grassy area, pond, and more. We enjoy sharing community meals in our newly rebuilt common house three to four times per week and work parties once a month. We have a rich set of traditions including coming of age ceremonies. We are a mixed community of half renters and half homeowners of around 11 kids and 50 adults. We make decisions by consensus with everyone having an equal ability to participate after having lived in the community for three months and having attended three meetings. We use a modified consensus where a 75% super majority can vote if consensus cannot be reached after six meetings and three months of effort have passed. So far, we have never gone through that whole process to a vote.